Worldbuilding: Awesome BDB paranormal world, Caldwell mixed up with vampires, sympaths, angels, afterlife elements…yum! Characters: Tohr and No’One (later in the book, she’s called Autumn) were brilliant. I always liked Tohr and was heartbroken about his shellan’s death. I kept liking him and understanding where he came from in this novel too. He had to let go, and everyone who ever loved somebody knows that letting go is the hardest thing. It’s torture, no matter if your love has died or simply left you – letting go is brutal. I empathized with his struggles and loved him all the more. Plot: This novel felt a little different because of the stories it told. I felt like there was a lot more emphasis on the emotional goings on between Tohr and Autumn, or between Xhex and John. Even between Quinn and Blay. Yes, there was action, but it felt to me like there was also more emotion, and I’m always going to pick that over fighting – of which there’s enough, never fear. Writing: As usual, third person narrative from more than one POV. 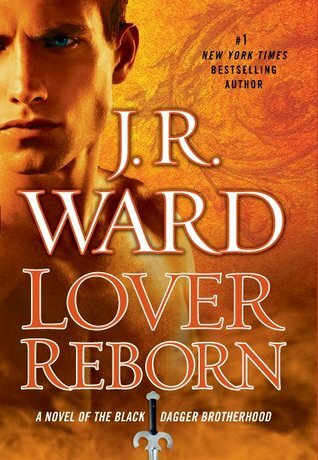 I felt more emotion than usual and the writing evoked more emotion than usual, so it seemed to me the writing in Lover Reborn was even better than in previous novels in the Black Dagger Brotherhood series. Curb Appeal: Pffft. Kickass cover, hooking blurb, epic author – instant buy material. All in all, I highly enjoyed this novel and felt a more personal connection with the characters than in previous ones. I also am an official Lassiter fan xD If you like PNR, definitely read it.